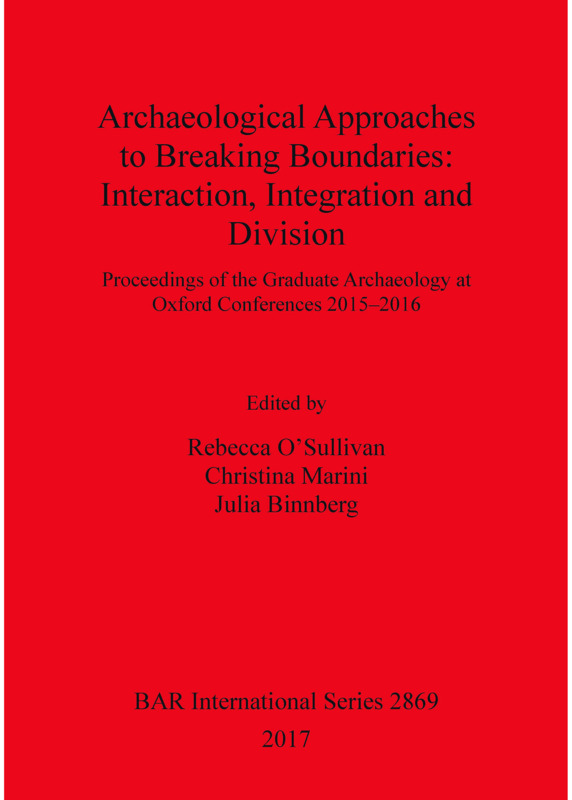 This volume brings together two Graduate Archaeology at Oxford (GAO) conferences held in 2015-2016 to present the work of early-career researchers from across the globe. The papers cover a range of periods and regions, but all share the focus of bridging boundaries, whether these are theoretical, methodological or geographic. Some contributors traverse traditional divisions between subjects by integrating computational approaches with early excavation data or archaeology with historical sources to produce 'thick interpretations' of the past. Several papers approach the past as a bilateral process, examining how people shaped and were in return shaped by their interactions with the world around them. In addition, many authors have directly tackled the modern political divides that influence our research. Building on a strong tradition of novel approaches and interdisciplinary methods, these proceedings present current research on directly tackling issues of division head on. Rebecca O’Sullivan is a postgraduate student at the University of Oxford specialising in the rock art of Eurasia, specifically Mongolia, northern China, and southern Siberia. Her research focuses on prehistoric animal iconography in rock art and portable art. She conducted her fieldwork in Xinjiang, China, and Mongolia. Christina Marini is studying for a DPhil in Classical Archaeology at the University of Oxford. Her research focuses on Achaea, Western Greece, from the 12th to the 8th century BC, and her interests include issues of identity, social change and connectivity throughout the Bronze-Iron Age transition in the Aegean. Julia Binnberg is a DPhil candidate at the University of Oxford. She has specialised in Aegean Bronze Age studies and human-nature interactions. She has written on triton shells in the Minoan culture and her current interdisciplinary project focuses on the significance of bird depictions in Minoan, Cycladic and Mycenaean art.